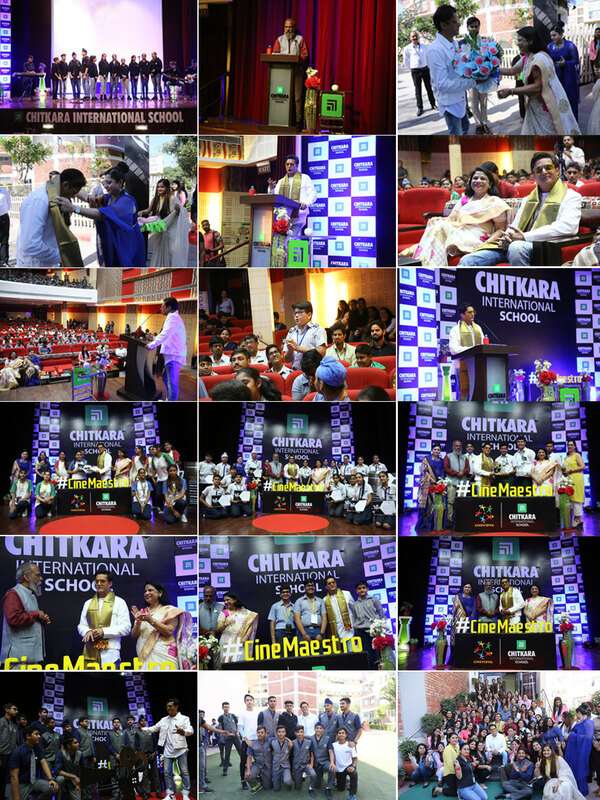 The mega event of CineMaestro- ‘shaping future filmmakers’, witnessed hustle-bustle of students from the tricity at CIS. The entire objective behind organising the pageantry was to use filmmaking as a learning tool and unleash students’ filmmaking skills respectively. Mr Jimmy Shergill, Bollywood actor and Producer and best known for his film, “Tanu Weds Manu and Mohabbatein” also graced the event with his presence as the Chief Guest. The day of the Award Ceremony saw the projection of outstanding short films submitted by the students of various schools. After the screening, all the short films were judged by Mr Jimmy Shergill along with Mr Amitabha Singh and team with all their might and prudence. The school witnessed innumerable submissions of short films, stretching from the genre of horror, touching themes of love and care to light-hearted comedy. Many of the budding filmmakers also held the attention of the audience by inculcating gripping narrative including female education. In addition to this, the school also had the provision of Online Category for the individuals who wanted to participate in the festival independently. The subjects of honing latent talent of underprivileged kids, the uniqueness of everyone, love for the country etc. were a few of the many subjects picked by the entries of the online category that engrossed everyone present. Every entry of CineMaestro Take 2 was incredible. “98 days”, by St. Johns High School bagged the title of “Exceptional”, for it being outstanding in every term. “The Race”, by The Gurukul School Panchkula stood 1st. Bhavan Vidyalaya Panchkula’s movie named “Things we can’t change” held position 2nd. The 3rd position was seized by Sri Aurobindo School for the movie “The Altruistic Art”. Saupins School sector 32, took the title “Best Innovative Idea” for the movie ‘’26th May’’. Amidst this, the title of “Best camera” was bestowed on Learning Paths School for the movie “It’s Ok”. The Gurukul School, Zirakpur seized the title, “Best Actor” for the short film “Planted in love”. “The experience given to the students by Cinevidya and CineMaestro in cooperation will certainly amplify their filmmaking understanding and skills”, says Mr Shergill while talking about the film festival.